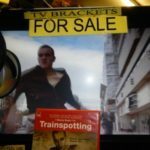 Backtracks Music in Edinburgh sell quality second hand televisions at bargain prices. If you need a TV for your new flat quickly call Tommy to arrrange large slim LCD screens 32", 40" with built in freeview or cheaper monitors or 17" portable televisions for gamers. near city centre. All our used / pre-owned TV/AV digital equipment are guaranteed working to your satisfaction fully tested prior to sale. Flat Screen TV wall brackets or adjustable portable black, white tv brackets available from £5. Aerial Cables, TV adaptor, accessories, scart to scart, hdmi leads or personal customer advice service and gift ideas. Pick up a quality bargain AV Amp- Freeview box, Digital recorder, DVD player or colour portable Dvd player from Backtracks wide selection guaranteed tested before sale and some able to play multi region formats, digital photos, mp3, cdg, or DVD stock. A fantastic selection of cheap films from 50p+ available in Edinburgh portable secondhand DVD & Video. Black, White or silver. Backtracks Music in Edinburgh specialise in second hand televisions at bargain prices. TV's from large slim LCD screens 32", 40" with freeview, cheap monitors to 17" portable televisions for gamers near city centre. All Used / pre-owned AV digital equipment guaranteed working to your satisfaction and fully tested prior to sale. Flat Screen TV wall brackets or adjustable portable black, white tv brackets available from £10. RF Aerial Cables, TV adaptor, accessories, scart to scart, HDMI leads or personal customer advice service and gift ideas. Pick up a quality bargain amp- Freeview box, DVD player or colour portable Dvd player from Backtracks wide selection guaranteed tested before sale and some able to play multi region formats, digital photos, mp3, cdg, or DVD stock. A fantastic selection of cheap films from 50p+ available in Edinburgh portable secondhand DVD & Video. Black, White or silver. A range of pre owned video's and video camera equipment offer fantastic value for all budgets. 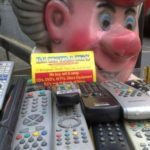 Additionally we have a range of VCR players - recorders, as well as Sky box, full range of extension leads, remotes & accessories. Check out what items Backtracks in Video Equipment stock. We also have a great selection of new + retro films Digital camera DVD & Video tapes in Tollcross free parking or car park nearby. Backtracks Edinburgh offers a range of cameras from Vintage to Nikon SLR, Canon, Fuji, Olympus etc or 35mm point and shoot models from small compacts through to Sony 8 video cameras. These items change on a daily basis so be sure to give us a call to check as often bargains are sold before listing ie Polaroid land camera instant, new style, retro classics, camera tripods, accessories, flash, bags, cases, chargers, batteries, etc Camera stock sealed, why pay more during cash credit crunch? Simple digital cameras from £5 plus excellent Sony, Panasonic, Olympus or even cheap slightly damaged models.